This Hari Raya we are making our sign up bonus bigger and better! In the spirit of celebration and giving, from now till 31 July 2017, get $30 when you sign up to drive with GrabHitch! Simply include the Referral Code ‘HITCHRAYA’ when you sign up with us on the Grab App. 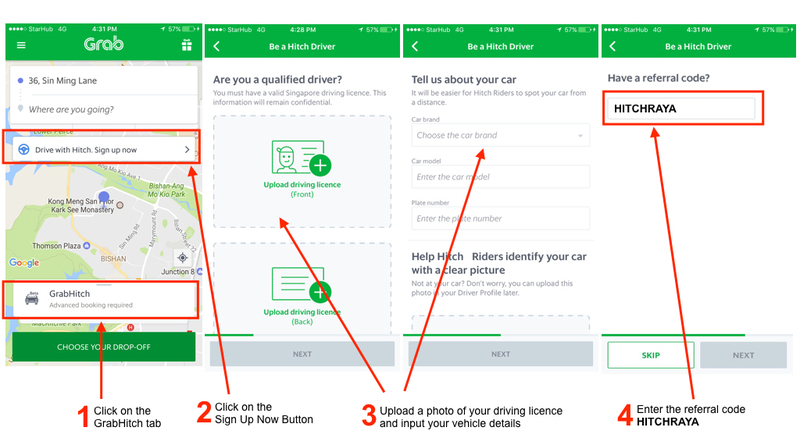 Simply put, GrabHitch allows you to “tumpang” someone who is going along the same way as you so that you can cover your petrol costs when you drive. You can browse from a list of people going to or from where you are going – and the best part of it, you get to pick the passenger you want to pick so you don’t have to detour much! Have a car that you can drive when its convenient? Why not make some additional cash with GrabHitch! If you are driving to or from work, why not see if anyone near you is going along the same way, and recover petrol costs while you drive? No additional licensing nor documentation is necessary. Signing up as a GrabHitch driver takes less than 5 minutes, straight from your mobile phone! Choose who to pick up and when to do so at your own convenience and schedule. Filter passengers by distance, time, gender, mutual friends, pick-up and drop off locations. Did you know that 76% of Hitch Drivers are PMETs? An average Hitch driver saves 58% on petrol! Signing up as a driver ONLY takes less than 5 minutes! From now till the end of July, get $30 after you sign up and complete your first ride as a GrabHitch driver! This incentive is only eligible for new drivers who sign up and successfully complete 1 Hitch ride as a driver between 22nd June 2017 @ 00:00 hours – 31st July 2017 @ 23:59 hours. New drivers must sign up with the referral code HITCHRAYA in order to qualify for the $30 credit incentive. The processing of the $30 credit into your Hitch driver wallet will only be conducted after the incentive period has ended (post-31st July 2017). Please allow up to 10 working days for the processing of the $30 credit into your Hitch Driver wallet. Please note that the $30 credit is not exchangeable nor refundable.